The Red Headed Woodpecker is a small species, they usually are only about 2.5 ounces in size when they are fully mature. They can range in length from 8 to 10 inches. Their wingspan is about 15 inches. 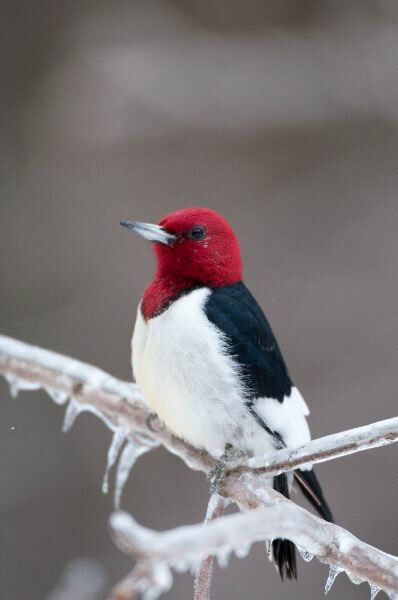 The name says it all – The Red Headed Woodpecker has a head that is completely red. The front of the body is white and the back of it and the feathers are either blue or black. They have a long tail that is white and either blue or black as well. They live in a variety of different locations. This includes around wooded regions, rivers, groves of dying trees, parks, open country, and around swamps. 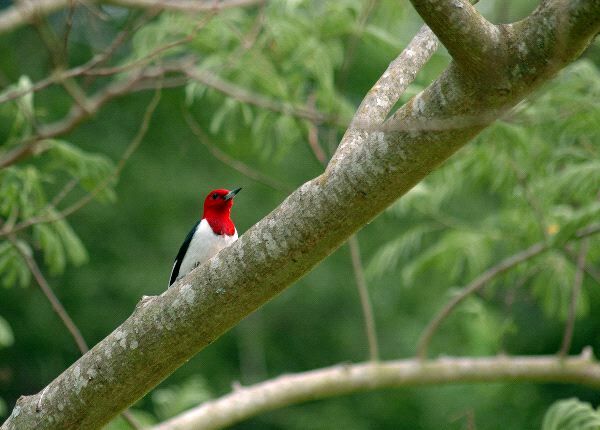 In many locations where the elm trees have been destroyed the Red Headed Woodpecker has been able to thrive. They are often able to make their nests and to store food in those locations. However, in many places the destroyed elms are being removed and cleared out. This can cause a great deal of the habitat for this woodpecker to be eliminated. Red-headed woodpeckers are solitary. They are very aggressive when it comes to protecting their territory. The Red Headed Woodpecker has been known to attack other species of birds that live to close to them. They will take the eggs from nests that belong to others and destroy the nest. All of this is to help them be able to protect their environment. The Red Headed Woodpecker uses its bill to be able to rapidly peck at the wood on trees. This helps it to gain access to various types of insects that they feed upon. They also consume grasshoppers when they are readily available. Seeds, bird eggs, spiders, nuts, and berries can all be part of the diet for them. They are one of the few species of Woodpeckers that store food. They will cover it with tree limbs, twigs, or bark so that other living creatures won’t be able to find it and take it. They also store it in several locations. That way if one of their hidden locations of food it taken they won’t lose all that they have been able to store up. The nests for the Red Headed Woodpecker are placed into areas of dead trees or branches of them. They can create a nest for 3 to 10 eggs. They tend to place the nest about60 cmor more from the ground to protect the eggs from predators. It isn’t really known what determines which of them will pair up. It could have to do with the displaying of feathers. The males and the females that pair up work as a team to offer the best for the young. They will take turns with incubation until the young arrive. Once they are present they are dependent on their parents for food. They may work long hours each day to bring enough food back for all of the young. If there are too many to feed successfully than only the biggest and strongest will get the food that is brought to the nest. They can typically live in the wild for up to 12 years. Right now this Woodpecker is considered to be vulnerable. They have been declining in numbers due to loss of habitat. Still, it can be hard to protect those locations for them. Humans are often very encouraged to clear out those areas because the dead forest seems like a lost cause to them. They don’t stop to realize that the Red Headed Woodpecker as well as other forms of life thrive in those areas.